I made these a few weeks ago when I was craving a BYU brownie. These were fabulous via mels kitchen cafe. The only thing I would change is a little less butter in the frosting and more powdered sugar to make it a bit more fluffy. Also Maybe a tad less salt in the frosting and brownie itself. Regardless, these were heaven and the company was in love as well! Note: This recipe can be doubled for a 9X13-inch pan. 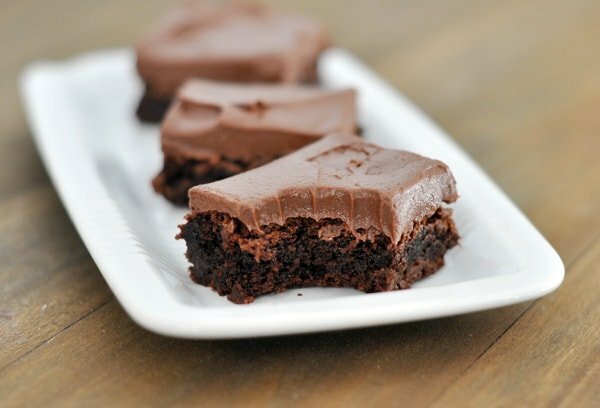 Bake for about 5 minutes less than the recipe states below and increase as needed while you check for doneness (cause there's nothing worse than an overcooked brownie). Preheat the oven to 350 degrees F. Line an 8-inch-square baking dish with foil, letting the excess hang over the edges (this helps to make "handles" for lifting out the brownies after they have cooled). Lightly grease the foil; set aside. In a medium-size microwave-safe bowl, combine the chocolate and butter for the brownies. Microwave for 1-minute increments at 50% power, stirring in between, until the chocolate and butter are melted and smooth. Whisk in the granulated and brown sugars. Whisk in the eggs and the vanilla extract. Add the flour, baking powder and salt. Fold the dry ingredients into the chocolate mixture with a rubber spatula until combined. Stir in the chocolate chips. Pour the batter into the prepared pan and bake for 25-30 minutes, until a thin knife or toothpick inserted in the center comes out clean or with a few moist crumbs. Remove the brownies from the oven and allow them to cool completely. For the frosting, using an electric mixer (handheld or stand mixer), cream together the butter, cocoa powder, and salt on medium speed for about 2-3 minutes. Scrape down the sides of the bowl and add the powdered sugar. Mix on low speed to incorporate the sugar. Add the vanilla and milk, starting with a couple tablespoons and adding more as needed to adjust the consistency. Increase the mixer speed to medium-high, beating until smooth and fluffy. Spread the frosting onto the cooled brownies. Store the brownies in an airtight container, or tightly wrapped, at room temperature or in the refrigerator (I highly, highly, highly prefer my brownies chilled in case you care) for 3-5 days.